This blog is intended to be a celebration of all the various facets of life that I enjoy, that I am curious about, and that I have explored or want to explore. As I actively pursue a life of discovery, the hope is that my appreciation and enjoyment will spur yours. A polaroid from the future. 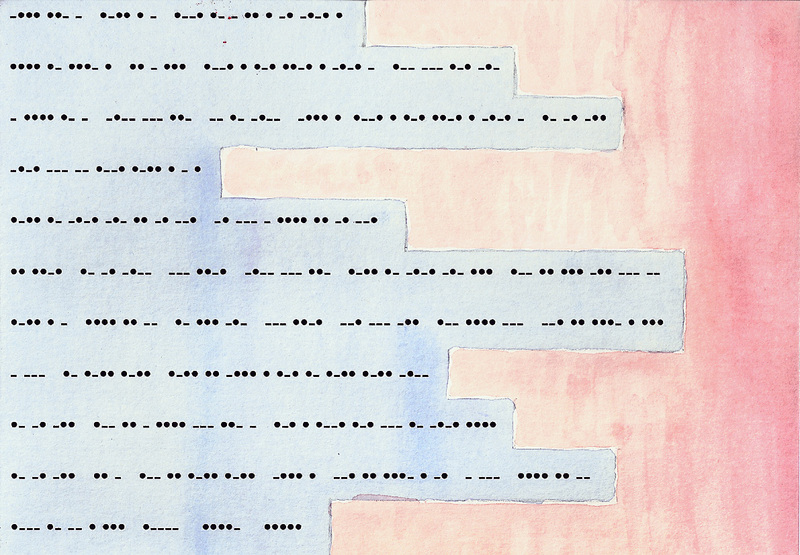 This is the continuation of our adventures in creative correspondence. For the beginning of the story, see here. It’s 9:50 on the morning of August 10th and countless masses of people all across America are poised anxiously at their computers. 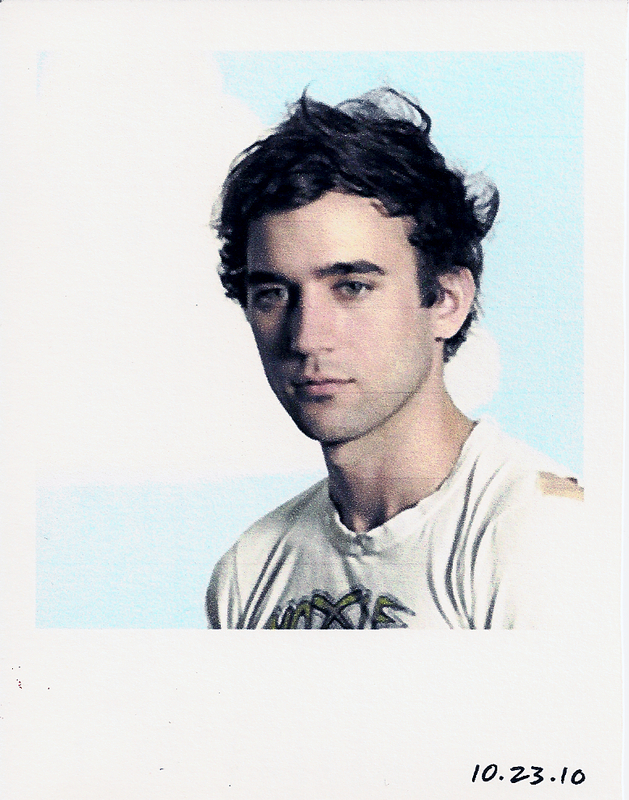 Sufjan Stevens had announced his 2010 North American tour a few days before and was putting a limited number of tickets on special pre-sale through his website. All shows would be available at 10 am Pacific. It’s been many years since I competed in any track and field events, but this really felt like it, in that futuristic, nerdy, hunched over the computer sort of way. Who knew how many tickets would be available, or how many others were nervously eying their clocks and the website that stated “No refreshing necessary”. At 9:58 I got a text from a friend: Sufjan’s site isn’t loading! Go to the site for the company he’s selling through! I quickly loaded the other page and as the clock struck 10 the option to buy tickets became available. Within a couple minutes I had my confirmation email. All too easy. I was just beginning to wonder if I’d been all worked up over nothing when I saw the streams of anguished Facebook and Twitter posts from people who never even got the chance to try through Sufjan’s site. Bummer for them, but for me it was an exciting moment with what I’m sure will be a wonderful payoff. And while you’re joining things, check this out: The day of the Sufjan concert is also the day that New Belgium Brewery will be making the Los Angeles stop of their Tour De Fat! So if you’re a fan of Fat Tire, or any of the other beers produced by this excellent Colorado brewery, you may wanna look into a Saturday of bicycles and beer. Here are the details. See you there! Watercolor with printed overlay, sent 8.9.10. Every now and then we all can feel a bit overwhelmed. I’m feeling it a little right this minute, actually. It’s been a week since I posted anything here because I’ve been interviewing and starting a new job. And it looks like it’ll be a really great one, but there’s a LOT to learn and not much time at all to learn it. I know I’m not alone in that feeling, and I know there were times this summer when Lindsay was feeling like there was more going on than she knew what to do with as well, which is why I made this particular card. 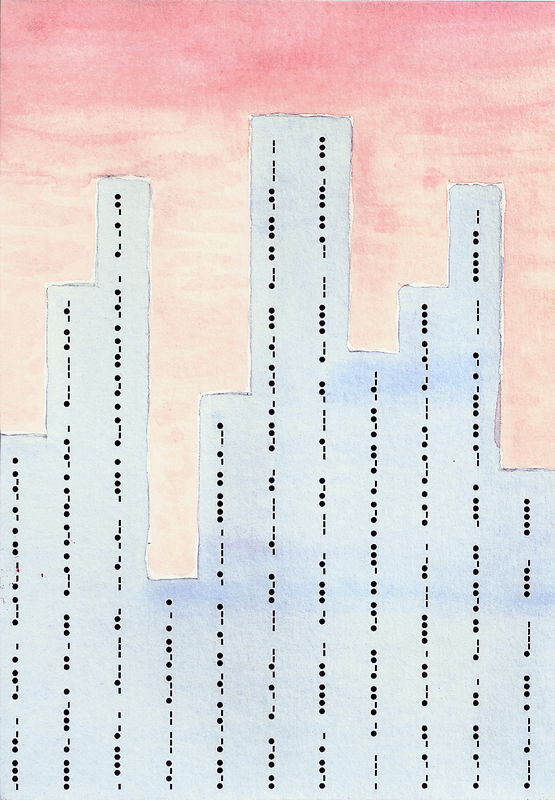 I feel that sharing the message of this card today, as I head into my second week of “going to work in tall buildings”, is particularly reassuring because I can send out a cry for help and know that it will be answered. Hopefully the momentary diversion of solving a minor puzzle will be a fun and encouraging way to get your mind off of the things looming on the horizon for you as well. The Handkerchief was once a standard piece of every man’s wardrobe. Today it seems to be little more than an antiquated memory, conjuring up images of an old farmer pulling a wilted and grimy piece of cloth from his overalls and wearily mopping his face as the sun sets over his rows of freshly tilled land. And here we are. Modern, highly germaphobic, and seemingly content carrying packets of transparent disposable tissues or rooting through the back seats of our cars for abandoned fast food napkins. I, however, am a man who prefers to be prepared. Since I don’t always carry a backpack and I don’t relish purchasing, disposing of, and restocking mountains of tissues, at some point in the last two years I bought an inexpensive pack of handkerchiefs. I had seen them at Target and thought to myself, “Self, those might be handy”. Far more than handy, today I can scarcely imagine how I ever went around without one (or two, when attending events that require a suit) in my pocket! Especially nice for someone like myself, who is walking and riding a bike and taking public transit, having something with which to wipe the brow after a little midday exertion makes one feel civilized. Speaking of being civil, probably the best benefit of carrying a handkerchief is being able to give it away. The offer of a handkerchief to a lady in need is a wonderful thing, and since most men I know don’t carry one, having one for another fellow in an emergency (say, to wrap a cut hand, or to dab a spill on The Groom’s shirt) is an easy and natural way to truly be a gentleman. I recently discovered this article, which actually does a pretty thorough job of outlining many of the things I had previously heard or read here and there regarding the handkerchief. Once Lindsay’s camp schedule got the better of her health I decided that since I wasn’t present to offer her a handkerchief that I’d just personalize a few and send them to her. Far more convenient than trying to carry around boxes of tissue while running all over camp and doing any number of activities, and I felt that a flat package of folded cloth would probably fare much better than my previous package. So I created a stencil from a concept drawing I had done a number of months back for a race she and her roommates were planning to participate in. Injuries and illness prevented them from running in the race, so shirts and other team paraphernalia were never created, but I just hate to see a good idea go to waste and I knew that she’d get a laugh out of them. The idea for The Sandpipers came from the girls seeing the speedy little birds racing along the surf, and the initial design was a simple silhouette of a sprinting sandpiper. 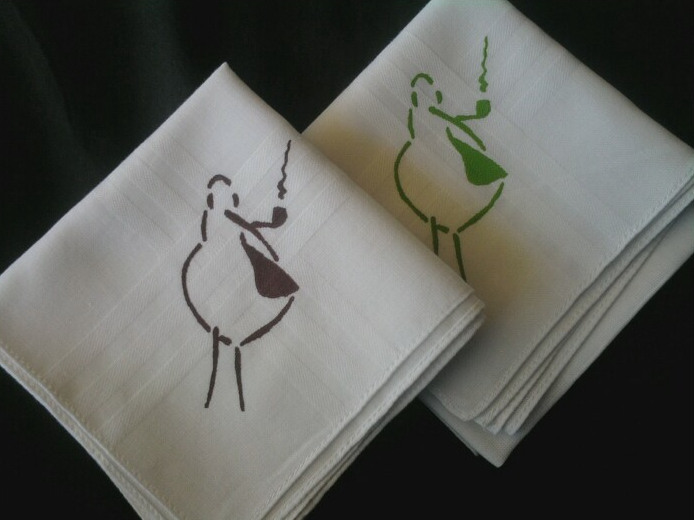 But of course, general silliness ensued and somehow the idea of depicting sandpipers smoking pipes came into being. 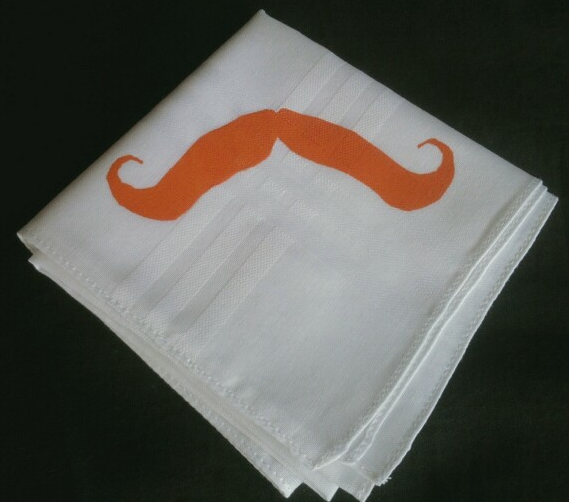 And since I was on a roll with screening handkerchiefs, I decided to make one more, for Lindsay’s occasional moments of jealousy, and more frequent moments of silliness. For all your oddly old-timey bank robbing needs. The Greyhound in early evening. It’s 5:59 and 92°. That, my friends, is entirely unacceptable. Fortunately, I know an amazingly simple solution to this problem. A few, in fact, but I’m going to share two of the simplest with you right now. Vodka and Grapefruit Juice. Traditionally served as a Highball, meaning a tall glass with ice, typical proportions would be 2 parts Vodka to 3 parts Grapefruit Juice. The above pictured is in a rocks glass, and it’s equal parts of each. A whole grapefruit should yield approximately 3 oz of juice. 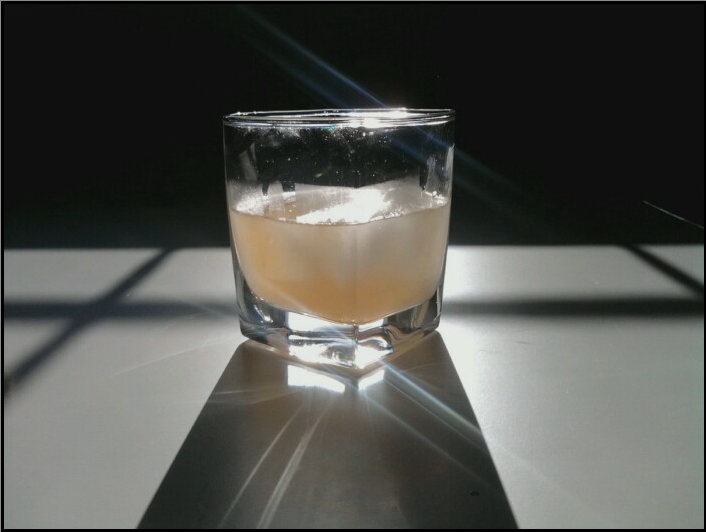 I had a leftover half of a grapefruit, so I did “a shot” (typically 1.5 oz) of juice and a shot of Smirnoff. Poured over ice and given a brief stir, the result is a crisp and tart citrus drink with a hint of sweetness. Cold and clean and refreshing. 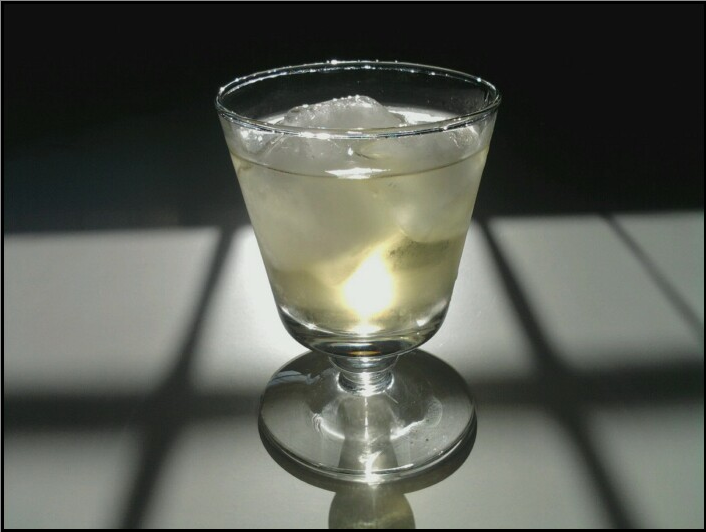 Gimlette: Common name for gin laced with lime juice cordial. The name comes from the name of the naval surgeon – Gimlette – who introduced this drink as a means of inducing his messmates to take lime juice as an anti-scorbutic. Sir Thomas D Gimlette, KCB, joined the Navy in October, 1879, as a Surgeon; he retired in June, 1913, as a Surgeon General. Stir and strain over ice, pour into an ice filled rocks (old-fashioned) glass. Garnish and enjoy. Now, as you probably know, I always want to do everything with the best, most fresh, most natural ingredients. Typically when I make a gimlet I use fresh lime juice instead of the concentrated Rose’s Lime. But I DO have Rose’s, and on this particular evening I didn’t have ANY limes at my disposal. Not to worry. The cordial is just fine, and it’s more in keeping with tradition. I tend to keep with Gin when making my gimlets, as the evergreen notes of the juniper really are a wonderful and interesting compliment to the lime. So there you have it, two brilliantly simple, cool and refreshing citrus drinks to fight the evening heat. And if you didn’t catch the reference in the title of this post, play this while you add some fresh juice to your clear alcohol of choice. It’s easy to become jaded. In fact, living in a city like Los Angeles it takes absolutely zero effort at all. Every street you walk down, every light you are stopped at, any restaurant or bar or club at any time of the day or night will present you with images of human brokenness. Whether it’s a drug addled, toothless and grizzled homeless man or a slick haired, Ed Hardy wearing, Lamborghini driving Hollywood hotshot, they’re all people at different stages of need and emptiness, craving hope and fulfillment and grasping at anything that they think might bring the answer, or at least a temporary respite from the questioning. And caring can, quite frankly, become exhausting. So without even realizing it you create layer upon layer of hardened shell. You develop an unconscious ability to look away, to brush off and walk past the grasping hands on the street. You build an impervious granite guard against the shallow boasts and cracked smiles of the cooler-than-thou crowd and even among the people you know and respect you may find yourself less and less motivated to make that effort to find out how they’re really doing. Because they seem happy enough, they’re probably fine, and heck, they’ve got a nicer car and a better cell phone than you, so what can they possibly need? Besides, that’d take work, and, ugh, effort, and besides, you’ve got plenty of problems of your own. You don’t have time for someone else’s. I was reminded during a time of prayer with a group from my church that this attitude is precisely the one we are to fight against, and that I need to be very conscious and intentional when it comes to the condition of my heart and my perception of people around me. I need to make that effort, do that work to chip away, to break apart and peel off those protective layers of selfishness and laziness and to earnestly engage in showing true love to those whose paths I cross each day. This does mean a lot more weariness, inconvenience, and probably even pain. Being tender hearted doesn’t claim to be safe, just the opposite actually. But if Jesus endured unimaginable pain and suffering for me, who am I to balk at the relatively minor imposition of having to care? 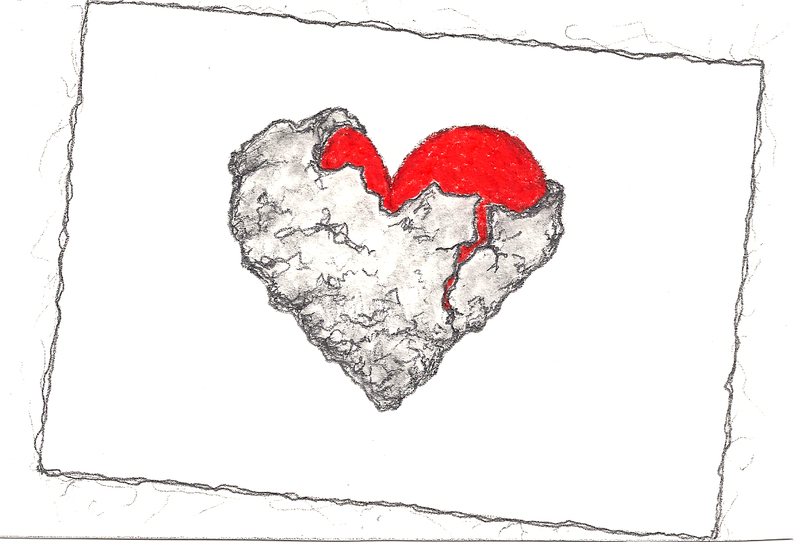 Far better to love and hurt than to have a heart of stone. 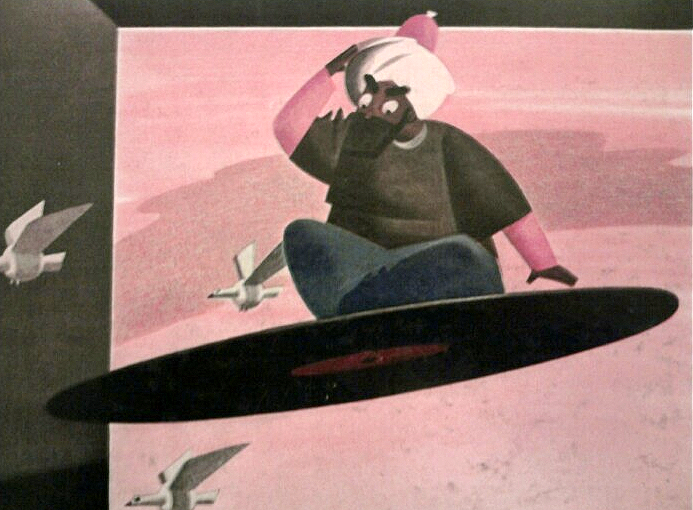 Cover Art from the 1942 recording of Rimsky-Korsakov’s Scheherazade. There is something truly charming about vinyl albums. They are such wonderful snapshots of history, culture and creativity. For a number of years now I have enjoyed digging through the “Discount Vinyl” section at Amoeba, sifting through stacks of dusty records at thrift stores, garage sales, flea markets and any number of other random sources. I did, however, find a few albums that appealed to my sense of art and humor. 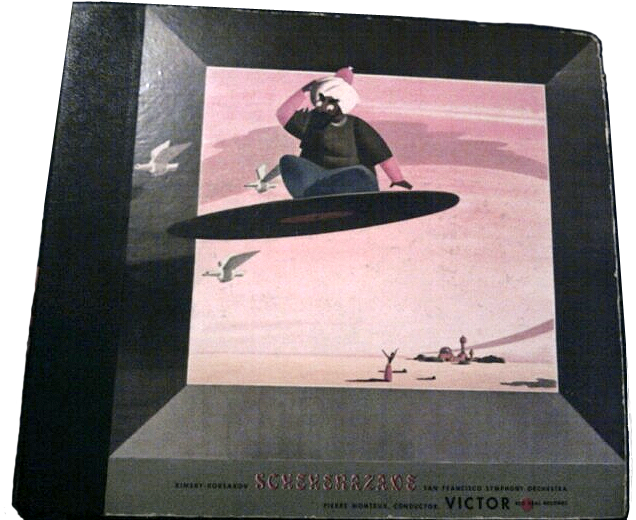 The Rimsky-Korsakov Scheherazade Symphonic Suite, Op. 35. Performed by the San Francisco Symphony Orchestra, conducted by Pierre Monteux. Violin solo by Naoum Blinder. Recorded March 3 & 4, 1942 in the War Memorial Opera House in San Francisco. This is a set of five 78s, in a large book format. These, of course, aren’t made of vinyl, but a rather heavy and brittle shellac compound. 78s will shatter like pottery if dropped, and the speed of rotation meant that you didn’t really get a lot of playing time on each side, hence 5 discs for a piece that runs just a bit over 45 minutes! This set is actually in decent condition, and truly a treasure. This piece of music, composed in 1888, really evokes an imaginative and fantastic sense of adventure, and is probably the one for which Rimsky-Korsakov is best known. The time of this particular recording also makes it an interesting piece in the historic context of the international climate of the early 40s. And really, the album art is just straight up cool. Read more about it here. And listen to it here. Due to my love of the movie So I Married An Axe Murderer, when I came across this next album I simply HAD to take it. 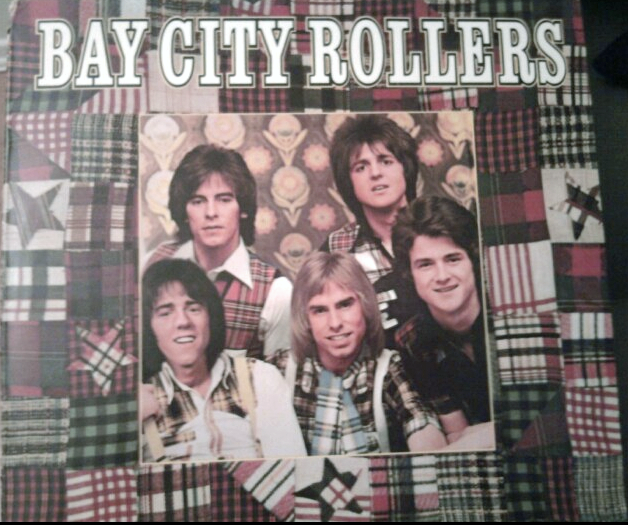 Listen to their hit Saturday Night, which became the first Billboard #1 of 1976 (on January 3rd) and is forever cemented in my mind as the song playing while Mike Meyers’ outrageously Scottish father (also played by Mike Meyers) dances around their living room. Last, and certainly not least, a fantastic bit of absurdity straight outta 1960! 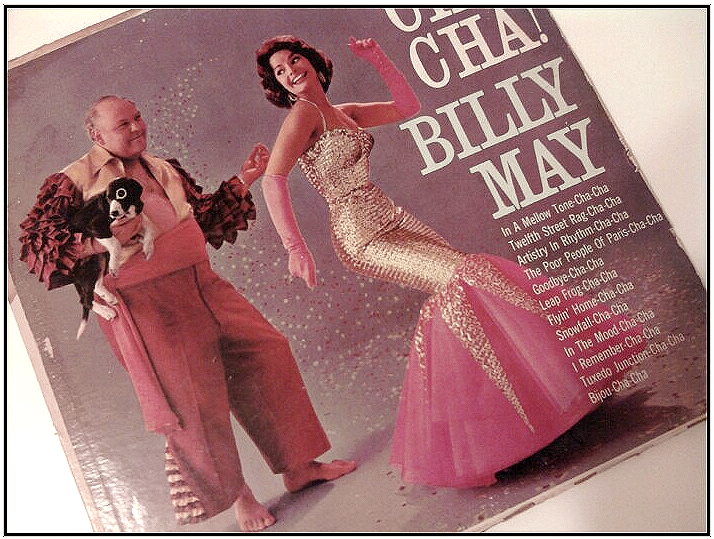 Billy May’s 1960 gem, CHA CHA! Simply Marvelous! How could anyone refuse the bare chested beckoning of Billy May? And if he and his delightful dance partner weren’t enough to get you in the mood, just check out the glowing description given to his work on the back of the album cover. Cha-cha-charming! OLÉ, Billy May – the new CHA-CHA champion of the world! If you are among the millions who have been captivated by that exciting Latin rhythm called the cha-cha-cha, then music-master Billy May has designed this album especially for you. Here, in the tantalizing tempo of this South of the Border dance sensation, is a collection of all-time instrumental favorites, brought up-to-date with delicate cha-cha-rrangements that offer a refreshing contrast to the spectacular big-band orchestrations so often associated with Latin dance music. Well known swing standards like Flyin’ Home, Tuxedo Junction, and In The Mood are magically transformed into light and nimble cha-chas by “El Gran Maestro,” who features here a wondrous assortment of flutes, employing them with great imagination and a good deal of subtle humor to duplicate familiar ensemble and solo passages. The brilliant trumpet and rhythm sections are manned by a fine group of Latin musicians, whose distinctive phrasing and enthusiasm give this album an excitingly genuine Afro-Cuban sound, while the mellow tones of an agile marimba provide additional authentic effects. Senor May also brings out the cha-cha-characteristics of such unlikely selections as Twelfth Street Rag, Snowfall, The Poor People of Paris, and several other wonderfully outrageous cha-cha-daptations of famous hits in which the flavor of the original arrangements has been retained. Only the beat has been changed to protect the innocent. Now I’m not one to criticize another’s writing, but I think those last couple cha-cha uses might have been stretching it a bit too far. Perhaps David Bowie could suggest a few cha-cha-changes. In my first post when I said these cards could be as simple or as complex as we wanted to make them, this was one of the cards I had in mind for the latter. Lindsay often will describe things as “Aaaamaaaazing! !” and one of the earlier ideas I had was to actually make her a maze featuring that word. 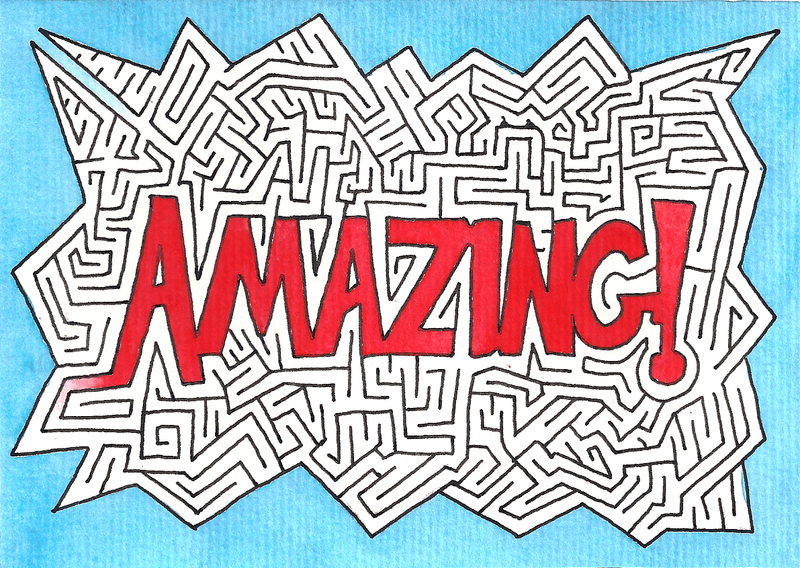 Not surprisingly, creating a decent maze is actually quite a bit of work, at least for a first-timer like me. I had a few different early attempts, and realizing the amount of time it would take me to create a decent final product I had kept this idea on the back burner for a while. Finally, on an otherwise open Saturday evening I sat down to work through it. After a number of hours of fun and creative design work, I had what I feel is a pretty decent little maze. Certainly not the most challenging maze ever created, but I really enjoyed the process, and the goal was to share a little something fun and silly. Try it out, let me know what you think. 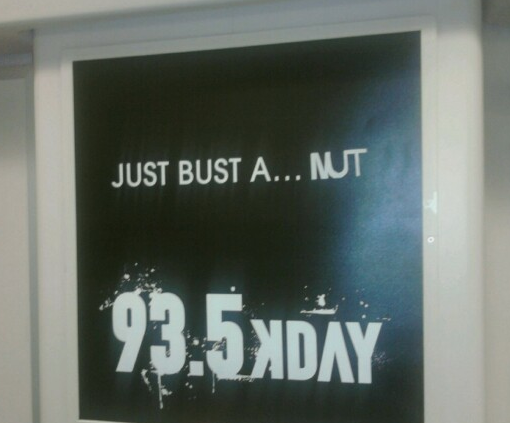 Someone had very cleverly cut the letters NUT out of the black background, creating an entirely new and inappropriate message. And I couldn’t help but shake my head and laugh. For many of my younger years I was fascinated by astronauts, space ships, Neil Armstrong’s walk on the moon, Sputnik, and the like. I think it was sort of a “real world” carry-over from my delight in the world of Star Wars. 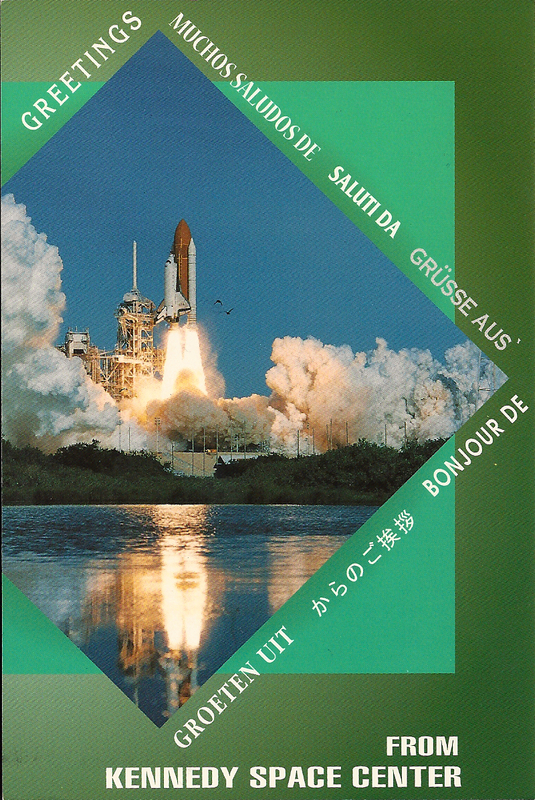 The idea of one day rocketing from earth and landing on some unexplored moon or planet was the quintessential adventure dream that I think all boys of every generation have, mine was just shaped more by George Lucas, Isaac Asimov and NASA than say, Robert Lewis Stevenson or Lewis and Clark. This postcard I recently found in a box of letters and stationary, most of it dating from 1996-98. A friend of mine had taken a trip to Florida with family and had written me a letter and included this postcard, knowing of my childhood astronaut dreams. I was happy to find it again and then to be able to send it as a way of sharing a bit of my story with Lindsay. 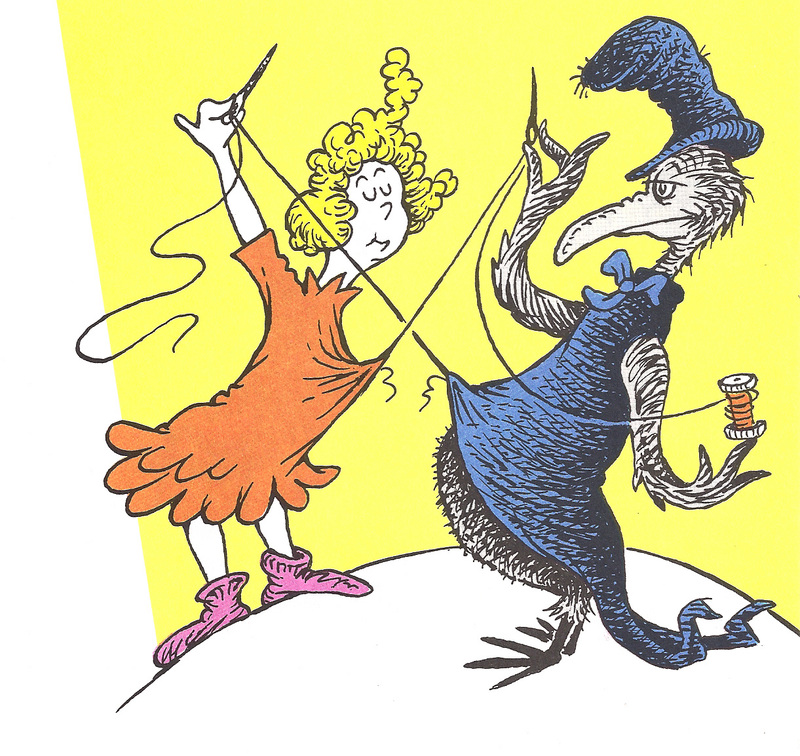 Slow Joe Crow sews whose clothes? Sue’s clothes. Trips to the local libraries were disappointing at best. A couple books on how to use a sewing machine, and only one (checked out) copy of each. Nothing on simple, classic hand stitching. Thank goodness for the internet, although initially I was only finding old illustrated instructions that were as simple to decipher as Egyptian hieroglyphs. Finally I found this helpful video series. With the help of Karen, the sewing expert, I was able to repair my shorts and, thus far, I’ve gotten a couple extra months use out of them. One of several very large tears that was repaired. But aside from the simple repairs, I’m a fairly DIY kind of guy, and the idea of being able to hand craft or hand tailor some things sounds like a great one. Of course I may discover that the trade off in time is worth the cost of having a professional do the task, but you never know till you try. 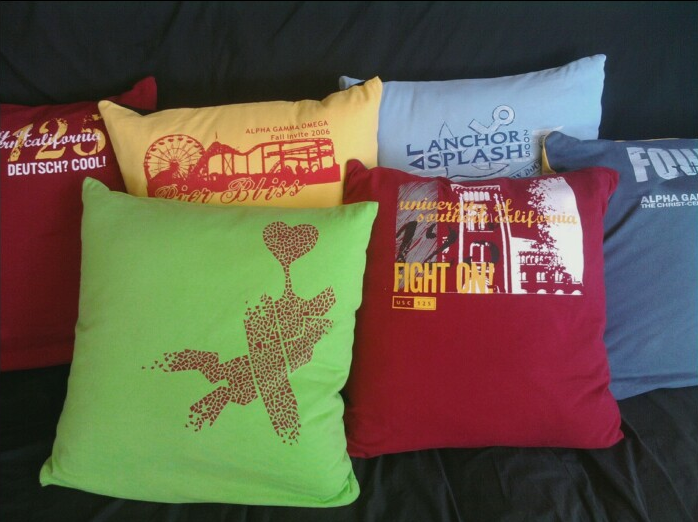 My friend recently created a bunch of pillow cases for me using some of my old t-shirts. Brilliant! Fun little memories are now back to serving a function, rather than being folded up collecting dust on a top shelf of the closet. Various shirts, including an early original design of my own, expertly adapted by Hannah Chen. It’s enough to make a grown man want a sewing machine. 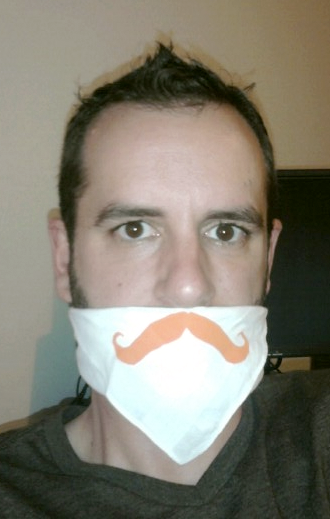 I’ve also been contemplating the idea of creating my own handkerchiefs. Very simple, and very helpful little things to have around. With a sewing machine hemming the edges would, and I could even experiment with stitching designs on them. By hand, the amount of time required and the imprecision of my stitching might result in a final product that wasn’t worth the time and trouble. For now, inexpensive white ones from Target will have to suffice for my creative canvas. If you know of a really good book, or books, or video series that would show the various forms of hand stitches and their ideal uses I’d love to check them out. Apparently I know so little about sewing that I don’t even know proper key phrases to use when searching on Amazon or the internet, ’cause I’ve had a devil of a time finding anything helpful. Who Is A Man Of Interest?